Darren McGregor's double sent Hibernian on their way to clinching the Ladbrokes Championship title thanks to a 3-0 victory over Queen of the South. David Gray was also on target as Hibs sealed promotion back to the Premiership at Easter Road. Falkirk's 2-2 draw at home to St Mirren ensured they moved 11 points clear of the Bairns with three games left. Hibs knew they had to take care of their own result first and they began as if they meant business, playing at a high tempo with all the players keen to get involved. A Jason Cummings lay-off was clipped over the top by Fraser Fyvie for Martin Boyle but, after taming the pass brilliantly, the winger found Lee Robinson equal to his shot. The Palmerston outfit made the most of their first real venture up the pitch in the 13th minute as Dom Thomas drove a knockdown from Lyndon Dykes inches wide. McGinn fired a free-kick to the back-post area where McGregor rose highest to loop his header over Robinson and into the far corner of the net. Just seconds later, the home side were incensed when referee Barry Cook called for a foul on Andrew Shinnie just as Cummings scampered clear through on Robinson from the midfielder's pass. 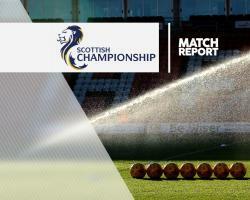 Queens showed they were still intent on trying to spoil the party but Hibs keeper Ofir Marciano brilliantly clawed out Stephen Dobbie's close-range effort after Joe Thomson's shot had deflected into his path. Boyle's superb 20-yard effort had been tipped round the post by Robinson for a corner and, when Cummings curled in the set-piece, McGregor was on hand to bundle in from close range. Cummings again floated in a corner and this time it was skipper Gray who headed in from four yards out to seal a comfortable victory as Hibs ended a three-year spell outside the top tier.